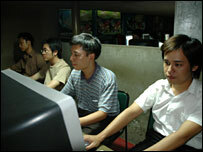 Internet use is growing rapidly in Vietnam, giving access to a wealth of information. The BBC's Kate McGeown looks at the opportunities this brings, as well as the challenges to the Communist regime. Like many urban Vietnamese, 30-year-old Pham Hoang is a self-confessed internet addict. "I couldn't live without it now. I use it all the time," he said, sitting in the window of one of Hanoi's growing number of wi-fi cafes. 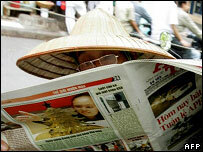 An estimated 13 million Vietnamese regularly use the internet - more than 15% of the population. Unlike its fellow Communist neighbour China, Vietnam does not impose many obvious restrictions on the material that ordinary citizens can access. So the new technology means that, for the first time, internet users can bypass the heavily-controlled state media and access a wealth of alternative information. "I read a lot of foreign press, as well as national press," said Pham Hoang. "It's not that I trust one side more than the other, but I read all sides so I can form my own opinion." This new freedom is something the government is struggling to come to terms with, because while it is keen to be an outward-looking regime, it remains a one-party state that does not tolerate opposing views. While the authorities appear to have sacrificed a certain amount of control over the general public's internet habits, it is a very different story for the few people who openly criticise the regime. Anti-government sites are blocked, and dissidents regularly report that their internet use is monitored and emails intercepted. "Just two days ago, the Ministry of Public Security informed to me that I would never be allowed to use ADSL internet at home, and maybe in my office too," said lawyer and political activist Nguyen Van Dai. "I asked them the reason, and they said that I violated national security," he wrote in an email from one of his constantly-changing accounts. In extreme cases, there are reports of cyber-dissidents who have been jailed for expressing their political views online. "It's to Vietnam's credit that it has made a lot of progress with electronic media, which lets people access the outside world," said Janice Beanland, a spokeswoman for Amnesty International. "But there are two sides to the coin, and the authorities can't yet seem to accept the freedom of expression that comes with it." The Vietnamese authorities know that internet technology is vital for the country's future prosperity, and are therefore keen to promote it. "The government has a programme to bring the internet to post offices and community centres nationwide," said Nguyen Tu Quang, an internet and anti-virus expert who works closely with the ruling party. The strategy appears to be paying off. Businesses are increasingly using the internet to source and research products, as well as sell their goods overseas. Wi-fi and internet cafes are full of students learning English, checking out overseas courses or chatting with new friends they've made online. But unfortunately for the government, this means that political opponents can also chat online, write blogs and set up forums - and if their movements are restricted by the government, as they often are, this is the perfect way for them to communicate. Even if the authorities manage to block their websites and forums inside Vietnam, the content they produce will still reach the outside world. The government has been trying various ways to restrict dissidents' use of the internet, particularly since an online anti-government petition was published earlier this year, which many people signed. But as is often the case, the authorities' efforts at control are not keeping pace with advances in technology. Nguyen Van Dai said dissidents were increasingly using voice over internet protocol providers, such as Skype or Yahoo Messenger, instead of email, because it is much more difficult to trace. "Security officers have questioned me many times - they knew what I sent and received by email, but they did not know what I talked, sent and received through Skype," he said. In embracing this constantly advancing technology, the government will ultimately have to concede that - unless it wants to tighten up controls on all its citizens, as China has partly managed to achieve - it cannot prevent people from looking at, or even producing, material against the regime. And despite the continued persecution of cyber-dissidents, the outlook for increased freedom of information in Vietnam is actually becoming more promising. When the internet first started to take hold, in the late 1990s, heavy restrictions were put in place. 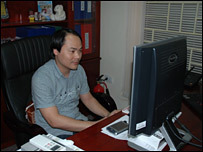 "The authorities didn't quite understand what it would bring," explained internet expert Nguyen Tu Quang. "But now they can see that the internet has benefited people hugely. That's why they've opened it up - much more so than China," he said. "The government has seen that the good outweighs the bad."